Solar commitments declined 24% in dollar terms even though there was record new photovoltaic capacity added, breaking 100GW barrier for the first time. 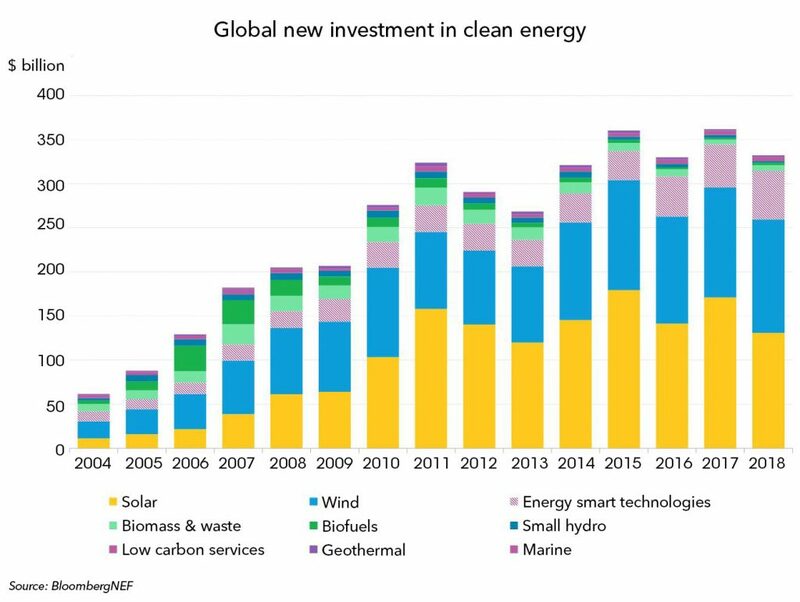 London and New York, January 16, 2019 – Global clean energy investment totaled $332.1 billion in 2018, down 8% on 2017. Last year was the fifth in a row in which investment exceeded the $300 billion mark, according to authoritative figures from research company BloombergNEF (BNEF). However, the most striking shifts were in solar. Overall investment in that sector dropped 24% to $130.8 billion. Part of this reduction was due to sharply declining capital costs. 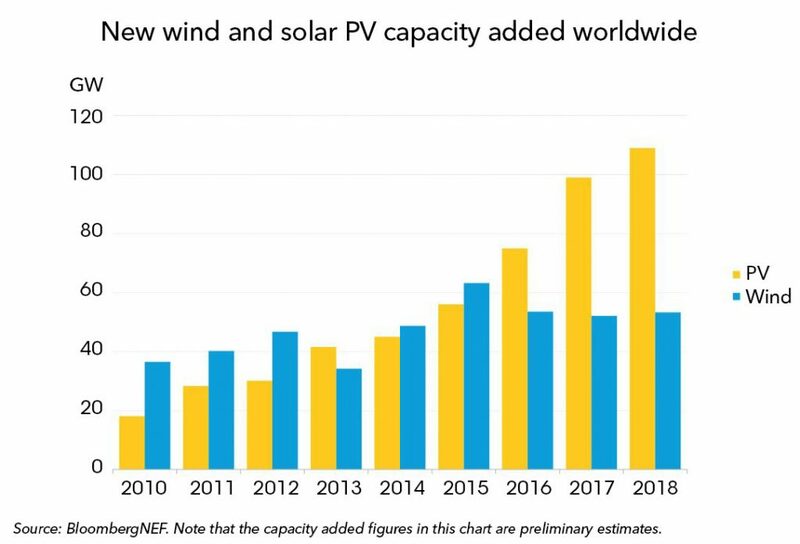 BNEF’s global benchmark for the cost of installing a megawatt of photovoltaic capacity fell 12% in 2018 as manufacturers slashed selling prices in the face of a glut of PV modules on the world market. The biggest solar projects financed included the 800MW NOORm Midelt PV and solar thermal portfolio in Morocco, at an estimated $2.4 billion, and the 709MW NLC Tangedco PV plant in India, at a cost of about $500 million. India is one of the countries with the lowest capital costs per megawatt for photovoltaic plants. Offshore wind was a major recipient of clean energy investment last year, attracting $25.7 billion, up 14% on the previous year. Some of the projects financed were in Europe, led by the 950MW Moray Firth East array in the North Sea, at an estimated $3.3 billion, but there were also 13 Chinese offshore wind farms starting construction, for a total of some $11.4 billion. Onshore wind saw $100.8 billion of new asset finance globally last year, up 2%, with the biggest projects reaching go-ahead including the 706MW Enel Green Power South Africa portfolio, at an estimated $1.4 billion, and the Xcel Rush Creek installation in the U.S., at $1 billion for 600MW. Some of the historical totals for clean energy investment in previous years have been revised in this round, to take account of new information on projects and deals. This is true, for instance, of the 2017 figure. The up-to-date numbers for total investment are: $61.7 billion in 2004, $88 billion in 2005, $129.2 billion in 2006, $182.2 billion in 2007, $205.2 billion in 2008, $206.8 billion in 2009, $276.1 billion in 2010, $324 billion in 2011, $290.7 billion in 2012, $268.6 billion in 2013, $321.3 billion in 2014, $360.3 billion in 2015, $330.1 billion in 2016, $361.7 billion in 2017, and $332.1 billion in 2018. More on BNEF’s 2018 clean energy investment figures can be found at //www.rfob.net/clean-energy-investment/. Investment in renewable energy excluding large hydro-electric projects, but including equity-raising by companies in smart grid, digital energy, energy storage and electric vehicles.